The last few weeks have been like an insane rollercoaster - first way, way, way up with a great super fun visit to a wonderful friend, full of stitchiness, laughter, and way too many carbs, all to come crashing down with a family emergency that's absolutely consumed me over the last two weeks. Things are settling down now, but needless to say, I feel drained. Caring for others is a big part of my personality, but I often am guilty of doing it to my own detriment, and I'm definitely feeling that whole candle-burnt-at-both-ends thing right now. Here's hoping a couple of days that have some semblance of normalcy will start to make that feeling subside. My first day of normalcy just happens to be MQG Sew Day, which was a fun coincidence, because it was an incredible reason to get into my sewing room during Lorelei's (all-too-short) naptime. While I've been mostly off social media the last two weeks, I've occasionally seen snippets here and there and one thing that I saw that stuck with me was Kate's adorable Tall Tales book block. 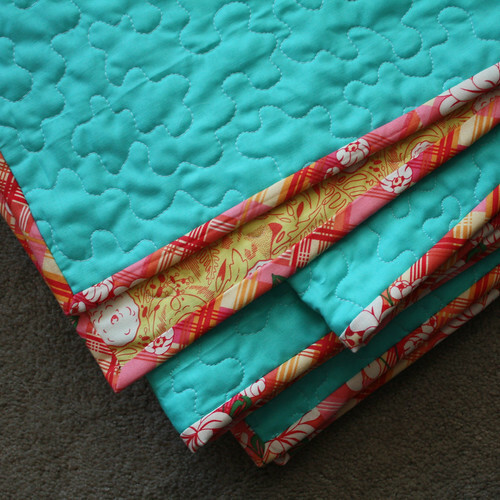 Just had to make one, with one of my most favorite fabrics that I've been hoarding for eons. I haven't decided what this will become yet - a pillow perhaps? a mini? we'll see - but it's a super simple paper pieced block that is way fun to stitch up. I'll work on a fun sewing update from my sewing-with-friends post-Christmas trip later this week hopefully as life starts to return back to normal, and in the meantime, I'll leave you with a snap of the newly crowned one-year-old Lorelei. She's not walking yet, because she can't be bothered to walk when she's the world's fastest crawler, but she is babbling up a storm. A new stocking for the newest family member! When I made our family holiday stockings a few years ago, Lorelei was most definitely not part of the equation, so fast forward to this year and at fleeting moments throughout her first year, I've thought of how she'd need a stocking, but over the last two weeks, that need became super pressing. We're one of those families that does our Christmas decorating the days after Thanksgiving, often on the Friday after Thanksgiving, but this year, I was truly worried the stocking issue would keep us from it! That and the Gilmore Girls revival release at 3am that very Friday (which of course was just about equally as important!). But somehow, I finished up a stocking for sweet Lorelei, and managed to watch the Gilmore Girls Netflix revival (no spoilers ahead, I promise! ), and our family decorating tradition is still holding strong. Phew. I realized when I hung the stockings that Lorelei's stocking is fairly matching, save for two things - the embroidery thread is different (white-white instead of off-white, darn it!) and then I managed to introduce mint to the color palette, but it works, I think, so I'm not going to go and restitch, that's for sure! Oh! And this year, the stockings are hung differently! When the husband saw what 3M Command hooks cost (this is precisely why you shouldn't take husbands to Target), we re-thought things for something we didn't have to keep re-buying year over year, so this is a fun set of lights from Target, a shower rod in bronze from Amazon, and shower hooks, plus various Christmas decorations I've gathered over the years (some new, some old). And one day, I'll have a real fireplace and mantel to hang the stockings on. Just not in Florida. There's nothing like having a daughter to make you want to sew pretty, pretty clothes. I've wanted to try garment sewing for years, but always felt intimidated by the large pattern pieces and crazy thick pattern packets for adult garments. But baby clothes? They're tiny! How hard can they be? I've been slowly gathering my courage to try making something garment-y for a few weeks now. Goodness knows that I surely have plenty of fabric to do it with! But I was totally lacking in the confidence department. Quilts are flat. They don't have to go over anyone's head. They always fit. I like quilts. Garments? That's a whole different story. So I thought I'd start small - even though I wanted to dive in and make a Geranium dress right away. I decided to pace myself, and start with a simple knit headband. I've never sewn with knits, so it was a bit of an adventure, but it turned out pretty okay. Having a cute baby to put said headband on sure helps it turn out okay! But sewing the headband made me feel a little more prepared for garment sewing, what with the curves and wiggly fabric and all. Most days, I'm wearing one if not many spit-up spots on my shirt. Spitting up is absolutely one of Lorelei's great talents. Most days, I wind up with baby poop on my person somewhere at least once. Most days, I get a super fun migraine or headache from the ear-piecing sound of my daughter screaming about something mysterious that she's upset about. Most days, I fall asleep at least once in front of my computer while working on a spreadsheet or while writing a work email. Most days, not only do I have to change diapers and take care of my daughter's waste products, I have to the same for my elderly dog, who's having accidents in the house. Poor Sam. Most days, I can't remember if I found time to brush my teeth in the morning. Most days, I screw up the laundry in some way, whether it's forgetting about a load in the washer only to discover it when it stinks up the laundry room or pink splotches on my husband's white undershirts. I hate sorting laundry, but it often bites me when something bleeds and I then have to try to fix it. Most days, my husband and I are ships passing in the night as he works crazy long days or is off traveling. Most days, I feel some sort of guilt. Whether it's guilt for not listening to something my son said over breakfast, or guilt for working on spreadsheets and schedules when my daughter's cooing at me, or guilt for not washing dishes...there's always something to feel guilty about. And on the worst days, I wonder what on earth I'm doing. Then something happens that turns me around - whether it's a smile from the baby or a hug or sweet words from my son or a little bit of extra coffee or chocolate, or just a few quiet minutes to myself to get my head on straight. Motherhood is hard work, for sure, but it has its moments. So there, that's what's really happening behind the scenes. Hope that you all have a good week ahead of you! Nothing too exciting or special, but it sure did soothe my soul to spend a few minutes with pretty, pretty fabrics and hearing the hum of my sewing machine again. Baby Lorelei is doing quite well, growing and changing rapidly. Her eyes are beginning to turn brown, I think, or maybe hazel like my dad's, and she still is the spitting image of her big brother at this age. It'll be interesting to see how much they wind up looking alike as they get bigger. The biggest difference so far is hair color - hers is much darker. She's smiling and cooing now, which is quite possibly the most adorable stage of infancy, in my opinion, and she's (knock on something!) becoming pretty easy-going. She's clearly my daughter, as she loves having a schedule and routine, and she gets several cases of hiccups a day, just like I did as a kid. Life is flying by already - Baby Lorelei is three weeks old today and I'm starting to feel like we're getting a bit of a routine going at last, which is the kind of thing I thrive on so I'm starting to feel at least a little more human. Still a sleep-deprived zombie at times, but that's what coffee is for, right? She's starting to be awake more (often not at "appropriate" hours of the day, ha, but she's starting to get the hang of this whole daytime/nighttime thing, I think), and is very determined to hold up her head on her own. For someone so little, she's definitely full of personality already. She's so tiny, I still find myself incredulous at the wonder of her. She looks a lot like my son did at this age, so I think they'll definitely resemble one another as time goes on. It's the third Sunday of June, and that means it's a day to honor our dads for all that they do in our lives. Father's Day is a little bit bittersweet for me, now that my dad is gone, but I try to think about the good times and all of the things I learned from him. And one of the things I learned from him is what a good dad does, and I think it really helped me to find my husband and know that he was the man for me. There's that old saying about how women marry their fathers, and to some extent, I think it's kind of true. 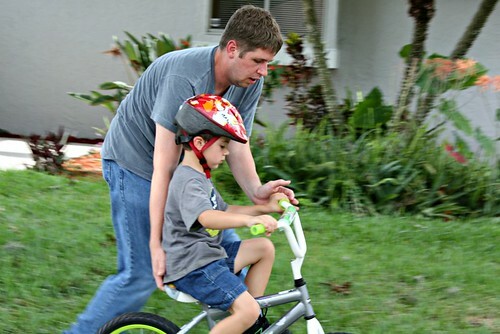 My husband has the same even temperament that my father did, even when I'm driving him crazy. He's an optimist, a comedian, but more important than all of that, he's a wonderful father. He always says that I'm teaching our son all that he knows, but he really deserves just as much of the credit, if not more. Oh yes, those are cookie dough cheesecake bars. Non-dairy ones even! And compared to most baked goods, they're fairly healthful. Best of all, they taste good. That's my main complaint with lots of the non-dairy stuff, but these are darned tasty. They need to set a bit longer, as the filling looks a bit soft, but I'm sure they'll be perfect by the time we have them after dinner. We're also cooking up some french toast this morning, adapting a recipe from Mother's Bistro in Portland. Remember how I loved their French toast when I was in Portland? My munchkin and I are making that this morning, just with various non-dairy milks in lieu of the whipping cream and half-and-half called for in the recipe. If you need a go-to French toast recipe, you need the Mother's Bistro cookbook, called Mother's Best: Comfort Food That Takes You Home Again . And there's way more than just French toast in there! It's a beautiful cookbook, lots of great, mouthwatering photographs and really authentic recipes. Thumbs up! I hope you've got a great day planned, and that your dad or husband is going to have a wonderful day today. Happy Father's Day everyone! It's the last week of school here at my house, and that means it's time for a little gift for my munchkin's preschool teachers. 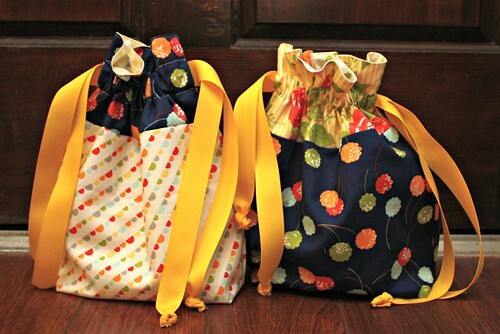 I made them some simple drawstring bags, using Happy-Go-Lucky. 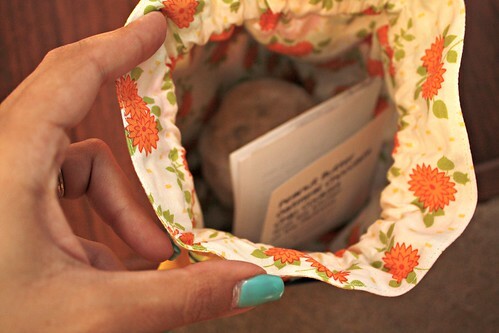 Such an easy gift to whip up! Then, I decided to fill them up with one of my favorite cookie recipes, peanut butter oatmeal chocolate chip cookies. Seriously, these are the best cookies! Since I'm on my new healthy journey, I didn't have any (wow, that was seriously hard! 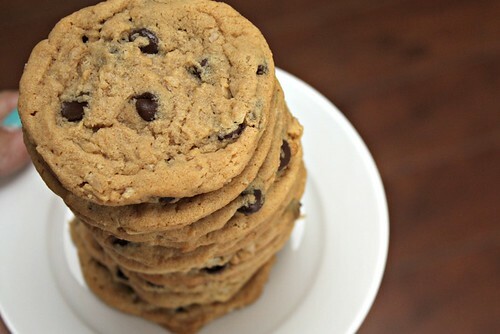 ), but I do know that whenever I make these cookies for people, they eat up every last one and rave about them. They're Brown Eyed Baker's Peanut Butter Oatmeal Chocolate Chip cookies, and I highly recommend them. My munchkin also made a nice thank you card to stick inside of each bag, and I printed up a copy of the recipe so the teachers can bake some whenever they'd like. It's bittersweet to be wrapping up the school year already - the munchkin will be graduating from preschool this week, and this fall, he'll start kindergarten. Where did the time go?!?! I get all choked up just thinking about him in a cap and gown this week. I'm going to need to stock up on tissues! While this is shaping up to be an exciting week, it sure started with a bang...a bad one. Our fridge went on the fritz last night, so I spent my evening fretting about all the groceries going bad and how much the repair was going to cost, rather than sewing like I had planned. I'm crossing my fingers that my handy husband is able to fix the darned fridge today without much effort or dough, but we'll see. Here's hoping that the week gets better today! Have a good day! I've been working on a quilt for the past week for a friend of the family who's just begun cancer treatment. Working on it has been a really tough process for me. Cancer hits close to home, way too close. My dad died of complications from lung cancer ten years ago this summer, and honestly, sometimes it feels like it just happened yesterday. I've been thinking of him a lot this week while I've worked on this quilt, and a part of me feels awfully guilty for that. 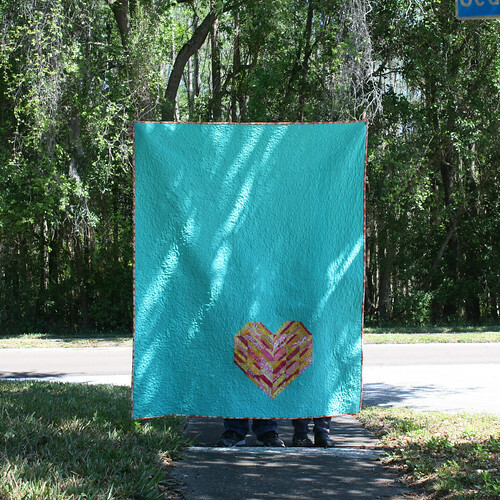 A part of me feels like this quilt should just be about helping this family friend, but then another part of me recognizes that I didn't take the opportunity to do something like this to show my dad how much I cared, so it's normal for him to be on my mind right now. I was a selfish twenty-something when he got sick, fresh out of college and hugely unaware of how little time he had left. There's lots of things I wish I did differently. But I'm thankful for the time that I had with him, and the things that he taught me. 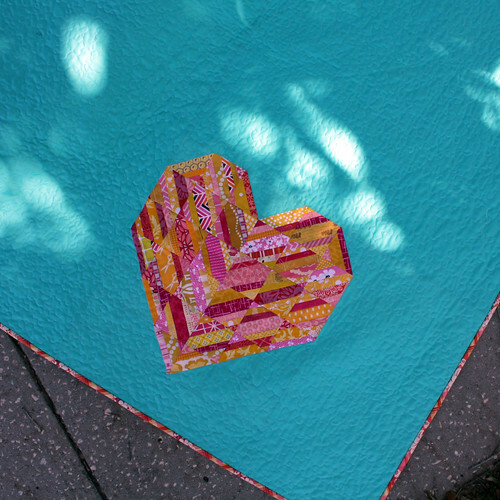 He taught me to care about people, and to show them that care, and that's what this quilt is about right now, and I think that's okay. 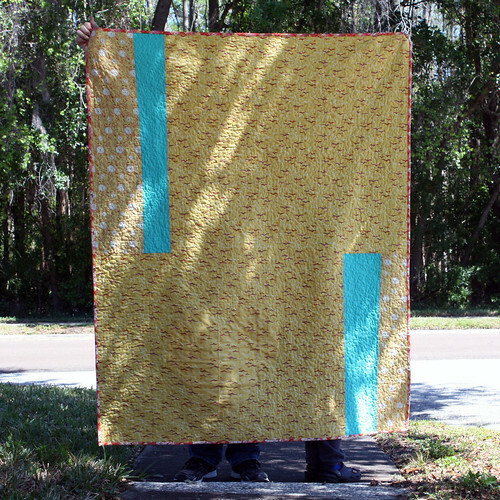 I finished up the quilt on Saturday morning, and took it outside to get some finished photos before gifting the quilt. The weather was positively beautiful, after a few days of dark clouds and rain. My munchkin insisted on getting in on the quilty photoshoot fun, and was surprisingly helpful at keeping the quilt still despite the breezy conditions. I quilted this quilt in a simple stipple, in 50 wt white Aurifil thread, from my very first mondo-sized Aurifil cone. Aurifil thread is fantastic no matter what size the spool is, but I have to say, the mondo-sized cone moves so darned smoothly off the cone. It was a thing of beauty to watch it unfurling as my machine whizzed away. For the binding, I used one of my favorite prints in the history of ever, Sandi Henderson's Peony Plaid from Meadowsweet 2. 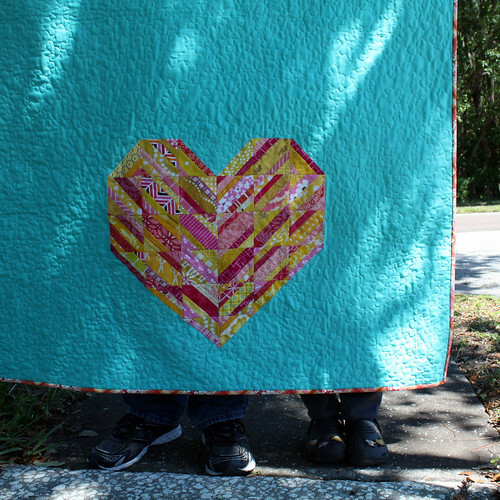 I love the colors in this plaid, and they worked perfectly with the bright, summery strings in the heart on this quilt.